How much time, energy and money do you invest in your most valuable asset? So you’ve made the decision to start working on your personal fitness. This is great news because becoming fitter is one of the best things that you could do for your health in the present, as well as for your health over the long term. After making the decision to start a fitness program, you may find yourself wondering, ‘where do I begin’? What does it really mean to become fitter? And, what steps should I take to get there? Before you dive into a workout program, it’s important that you come to understand all the factors related to fitness so that you can ensure you get started on the right path. After all, if you are going to devote a decent amount of time each week to exercise as part of a personal fitness program, you should be confident that the program is going to deliver. • What are the components of fitness? After you’ve finished reading this, you should feel confident you are ready to dive into your journey into fitness. First we need to give you a definition of what fitness is. By understanding this, you have a better idea of exactly what it is that you are working towards. Fitness, in general, can refer to a state where you are training your body or mind to improve optimal function and performance. Basically, you are creating a stronger, better you. Fitness is defined as being in the condition of physically fit and healthy and also being able to fulfill a particular role or task you are attempting to carry out. Being ‘fit’ then essentially means being capable. The great news is that fitness is something that works on a spectrum. It’s not a black and white picture of whether you are fit or you aren’t. Instead, there are various levels of fitness as you climb up the ladder and achieve personal bests. This is great because it means that you will always have something new to work towards. You will never attain a level of fitness where you simply cannot get any more fit – it’s an ongoing process that essentially never ends. This is also why working on your fitness is a lifelong journey. It’s not something that you are going to do, achieve, and then quit. In fact, if you do that, you will see your fitness level decreasing back to lower stages. So this said, let’s look at some of the main components of fitness that you need to know about. When we say ‘fitness’, we can refer to a number of different qualities that any person may possess. Keep in mind that just because you are very fit in one component of fitness does not mean you are fit in all components of fitness. Unless you are actively working on those components, there’s a very good chance that you aren’t all that fit, which is why finding a well-balanced fitness program is so important. Let’s look at the main areas that should be focused on. The first area of fitness is aerobic fitness. This type of fitness stands for your ability to performing ongoing activity for longer periods of time while utilising oxygen during the activity. When most people say the term ‘aerobic fitness’, they think about running on a treadmill, peddling on a bike, or using some other piece of cardiovascular fitness equipment. Aerobic fitness is going to help train your heart, ensuring it’s strong and can keep up with increasing demands being placed on the body. Note that to be working aerobically, you will need to be in the moderate intensity zone, anywhere up to around 50-85% or so of your maximum heart rate (most easily determined by taking 220 and subtracting your age, eg. 35(yrs old) – 220 = 185 maximum heart rate). If you go above this level, you will then move into anaerobic fitness. Which now brings us to the next category of fitness, anaerobic fitness. Anaerobic, by definition, means without air. So this element of fitness is where you are exercising so intensely that you are not able to deliver sufficient air to the working muscle cells. As a result, anaerobic fitness comprises of very short intervals of training as you can only exercise so long before you have to stop and rest, catching your breath. Many different types of activities will be classified as anaerobic fitness. If you were to perform high intensity interval training on a treadmill for instance, that would be working your anaerobic fitness level. If you were to participate in an intense game of soccer where you would run after the ball for about 30 seconds before stopping, this too would be anaerobic fitness. Likewise, strength training activities, which we’ll talk more about next, also involve anaerobic fitness as you can only continue lifting the weight for so long before you have to stop, rest, and recover. Working your anaerobic fitness level is also going to train your heart to become stronger and because it is so intense, will typically also help you generate speed and power as well. Finally, you’ll want to note that training this area of your fitness is also best for boosting your resting metabolic rate as you will experience a phenomenon called excess post exercise oxygen consumption (EPOC) once you are finished. This is the additional energy you will burn after the exercise is completed in order to bring your body back to a state of homeostasis. For those seeking fat loss, EPOC will really add up and can help give them an edge on seeing optimal results. Moving along, the third type of fitness that you’ll want to be working on is your muscular strength and power fitness capability. This refers to how well you are able to act against a force of resistance or weight. The stronger you are, the easier everyday lifestyle activities are going to feel. You can work on this element of your fitness level by utilising bodyweight training activities, resistance band training activities, or weight based training activities, using gym equipment or free weights such as dumbbells and barbells. 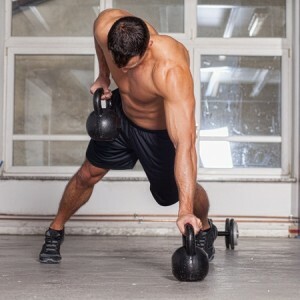 This is one area of your fitness that is extremely important to be paying attention to because if you don’t, you will naturally begin to lose muscular strength as you get older and as you lose muscle mass tissue. This is one of the primary reasons why people find they become weak in old age and also potentially suffer from weight gain. Lean muscle mass is highly metabolically active tissue, so by making sure you maintain your lean muscle (or even build more muscle), you can ensure that your resting metabolic rate is running on high speed and you are burning up calories readily throughout the day. Power is essentially a component of muscular strength which measures not just how much sheer weight you can lift, but how quickly you can lift that weight. Working on your power capability is important if you do participate in any athletic sports or simply to grow stronger yourself. When training for power, you will typically perform normal strength building exercises however you will really focus on trying to lift the weight as quickly as possible (and then slowly lower it back down again). This is referred to as switching around the tempo of the exercise as you are adjusting the speed in which you raise and lower the weight. Working on muscular strength fitness is one of the best ways to improve your quality of life, maintain a healthy body weight and appearance, as well as enhance your health. Weight lifting exercises will provide a number of key health benefits including stronger bones, stress relief, improved insulin sensitivity, increased heart health, as well as lower blood pressure to name just a few. If there is one area of your fitness you should focus on, this would be it. The next area of fitness to consider is your balance and agility. This area of fitness is often overlooked by many people as it’s not a common area to train. If you are an athlete however, you can rest assured you have trained this area before. The balance and agility area of your fitness comprises how well you are able to move your body through space and stay upright despite forces acting upon you. 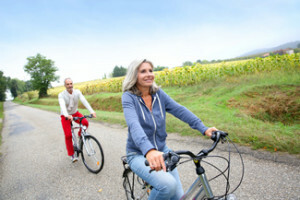 This is another area of your fitness that typically declines with age, which is also why it’s important to be training. If you are participating in any other fitness activities, you will be working your balance and agility to some degree as you will need a base level to simply perform the exercises you are attempting to do. That said, you can further improve your balance and agility to performing exercises that have you balancing on a single leg, a Bosu ball, a wobble board, an exercise ball, or anything else that throws off your balance. Athletes in training will definitely want to be looking at this element of their fitness as it can really influence the overall performance they are able to give. Another area of fitness to take into account is your flexibility fitness. This refers to how wide a range of motion you are able to move your body through based on the elasticity of your muscles, joints, and ligaments. Those who are very inflexible will notice they struggle to perform simple routine activities as they can’t move their body very well, while those who are hyper-flexible need to be careful that they don’t injury themselves as they typically can move into too large of a range of motion easily. So you don’t want to be at either ends of the spectrum with this one. Most people never need to work about being hyper-flexible however, so instead, just focus on increasing your flexibility. The best way to improve flexibility is through regular stretching activities (always after a warm-up or workout session has been performed) as well as through certain types of fitness endeavours such as yoga. While most areas of fitness do require you to take days off throughout the week so that your body can rest and repair, flexibly training is something that you can and should do daily. The more often you can do it, the better. It’s also something that you will lose quite quickly if you aren’t working at it. And once you have lost it, it can be challenging to get back. By improving your flexibility, you will not only find day to day activities become easier, but you’ll also notice that you experience a lower risk factor for becoming injured and you will see greater improvements in other areas of your fitness because you are more capable of performing all the exercises you do better. Flexibility training is not an exhaustive form of training, so something that you can just about do any time during the day. Just always do be sure that you are warming up before performing this type of training to avoid pulling or straining a muscle that’s tight and tense in the body. The next type of fitness to consider when devising a training plan is your coordination fitness capability. This refers to how well you are able to move your body in the movement patterns for optimal performance. Those who are highly coordinated typically excel at sports activities as these involve a high degree of hand-eye coordination and being able to move their body to achieve a desired end goal. Having good coordination fitness is less important for day to day activities as some of the other components of fitness noted above, however this one is definitely a must for anyone involved with athletics as just noted. You can improve your coordination fitness by performing activities that require coordination itself. Repeating exactly what it is that you hope to do is the best way to boost coordination over time. Finally, the last type of fitness that you need to be aware of is your mental fitness level. This is usually not thought of when referring to overall ‘fitness’ capacity as it doesn’t refer to a muscular component, but having a fit brain is also important for optimal function. This refers to your ability to have quick reaction times, good memory, great spatial awareness skills, and have a fast level of mental processing. Just as you need to train your body, you also need to train your brain. Any sort of activity that involves intellectual activities will help train your brain and keep you mentally sharp. This will not only help out when performing certain types of physical fitness tasks, but will also be very important for career and personal development reasons as well. These are the main components of fitness to be aware of. A good program will touch upon all of these components so that you are developing the most well-rounded level of fitness possible. Now let’s talk about the types of fitness equipment that are available to use to achieve these objectives. There are a number of different types of fitness equipment that are available for you to use to achieve a higher level of fitness. There’s no right or wrong way to go about achieving your goals in terms of which types of equipment you use, so it really comes down to personal preference and goal set. Of course certain types of equipment do lend better to achieving certain goals, so matching those types to your goals is important. Let’s look at some of the most conventional fitness equipment options available. The first piece of equipment? Your body. Believe it or not, you can accomplish quite a good fitness level all by using only your body as a form of equipment. Bodyweight training is great for those who wish to work on their fitness at home or who have a limited budget and can’t purchase pricey gym memberships or other equipment for a home gym. While you won’t get extremely strong using bodyweight training as your strength is pretty much limited to your own body, you will gain strength, improve agility, increase cardiovascular fitness, and enhance balance through this form of training. Resistance bands are the next option for challenging your body and improving your strength. You can perform many of the same exercises using resistance bands as you can using free weights (discussed next), only these bands are much more cost effective to purchase and can be stored anywhere. This makes them ideal for home fitness programs or for those who are traveling and need to pack something for on the road. Just like with bodyweight training however, you will be slightly more limited when using resistance bands as there is only so much resistance the band can give. While they do come in different strength levels, once you reach a certain level, they may not challenge you as much any longer. Which now brings us to free weights. 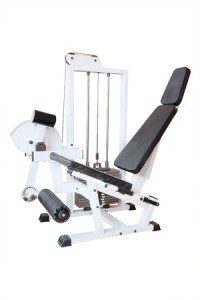 This is a very popular form of fitness equipment to use and is one of the most beneficial. Free-weight training – that is using dumbbells and barbells – is excellent for gaining strength through the muscles that you are targeting as well as the core. Your core muscles will need to contract hard to keep you balanced, therefore they get an excellent workout as well. It is important before working with dumbbells or barbells that you do take the time to learn how to perform the exercises correctly or you may put yourself at risk for injury. Kettlebells are one of the newer additions to the fitness equipment line-up and are very much like dumbbells only will exert a slightly different force pattern. They are great for performing compound exercises and helping you gain a high level of total body strength. They are very often used either with or as an alternative to using free weights. Weight machines are the next type of fitness equipment you can use and may be the type you most commonly think about when thinking about ‘gym equipment’. These machines have you sitting or lying in the machine as you complete a movement pattern that will strength one or more of the muscles in the body. Typically weight machines can be a great alternative for beginners who aren’t yet comfortable moving to free weight training or as an add-on to free weight exercises. Weight machines do offer some degree of protection from injury because the machine will guide you through the movement, helping ensure that you do it correctly. This said, as machines do lock you into a certain range of motion, if you are very short, tall, or have very long/short limbs, it may make a particular exercise feel very awkward, potentially increasing your risk of injury in some cases. Moving along, another traditional piece of gym equipment are the cardio machines. These are your bikes, treadmills, ellipticals, rowers, and stair climbers. These are all good for boosting your aerobic or anaerobic fitness training, depending on the manner you use them. They are highly convenient for getting in your cardio training as you can use them rain or shine, day or night. For those who want to move away from the conventional cardio machines mentioned above, skipping can be an excellent way to get your cardiovascular fitness training in and can be done anywhere you have an open space. A well-built skipping rope can be stored anywhere, so this is also a great option for those who are using a home gym. Exercise balls or Bosu balls are another piece of fitness equipment to note. These are typically used to help improve your balance and agility conditioning level and/or your core strength. These balls are relatively cost effective as well, so can work well in both the home gym and commercial gym environment. You can perform some of your regular dumbbell based strength training activities using these or you can perform exercises that are specifically designed for the exercise or Bosu ball. Finally, the last piece of equipment to know about is the aerobic step. These steps are typically utilised during a step aerobics class, which is another method of working on your aerobic fitness level. This said, you can get creative and use steps for other purposes as well such as performing standing calf raises off them holding a pair of dumbbells. They’re more of a fitness accessory than a piece of fitness equipment itself, but need to be mentioned nevertheless. So there you have the main types of fitness equipment that you should be considering as you move through your training. Keep in mind this list is not exhaustive and there are other types of equipment available as well, but these are the most commonly used pieces of equipment that you will come across. The next thing to consider is what to look for when starting a fitness program. With thousands of fitness programs on the market today, finding a plan that works for you is not an easy feat. There are a number of things to consider. Here are the main points to address when choosing a fitness program. First, make sure to take into account your skill level. If you are a beginner, the last thing you want to do is get yourself onto a fitness program for a more advanced exerciser. Most programs will state what level they are targeted for, but even if they don’t, you should easily be able to recognise this by looking at the nature of the program. Beginner programs should be shorter and lower intensity, while more advanced programs can increase from there. Next, also consider the time commitment. How much time per week can you devote to a personal fitness program? At minimum, you should be spending 20-30 minutes, three times per week doing strengthening activities, another 20-30 minutes two times per week doing cardiovascular activities, and then another 10 minutes most days of the week doing flexibility based exercises. This would be considered the bare minimum to obtain a well-rounded level of fitness. Of course you can do more than this, but this should serve as a good guideline. Consider how much time you have to devote to your training and then be sure whatever plan you are going to use matches this. It makes no sense to try a plan that calls for more total time commitment than you have to give, or you will only end up feeling frustrated. Also take into account the equipment required by any fitness plan you are thinking of using. Make sure that you have access to all the equipment (realistically). If you hate driving to the gym, find a workout program that is designed for a home gym instead. You have to want to do the workout for it to be successful. Make sure that you also look at your overall goal setting as well. Do you want to lose weight? Build strength? Improve sports performance? Enhance health? Figure out your goals and then make sure that your program is directed towards helping you achieve those goals. Finally, also take into account any sports or other daily activities you do. The more active you are outside of your workouts, the less total time you can devote to those workouts. Remember that your body does need time to rest and recover from each workout session you do, so the more active you are on a daily basis, the longer that recovery process will likely take. If you play sports twice per week for instance, you aren’t going to be able to do a fitness plan with as many weekly workouts as if you didn’t play sports. By using these factors as guidelines, you can be sure that you are selecting a fitness plan that will work well for you. Having a good gym, fitness club, or home gym to use to improve your fitness is a must for success. While with a home gym you will be creating your own atmosphere, when it comes to finding a gym, there are some other key things that you’ll want to look for and consider. Many gyms will have you sign up for an annual or longer membership if you want a discounted rate, so you want to be sure the gym is a wise choice before signing any contracts. It’s a very good idea to pay to use the gym on a trial basis for the first two times and actually go and do a few fitness sessions. This will give you the best idea of exactly how you feel about the gym and location. This said, there are a few key things that you’ll want to keep in mind when looking for a gym. Let’s go over what these are so that you can make an informed decision. The first factor to note is cost. This is a big one for most people and may be one of the most deciding factors. When looking at cost, compare monthly memberships to annual memberships. The longer you sign up, the greater the chances are that you will get a discount. Just be aware that if you do sign up on contract, if you choose to cancel early, there will be cancellation fees. Be sure to read the fine print. Also look closely at the equipment available. Do they have all the equipment you will want to use? Also take into account how many cardio machines they have overall. When it gets busy, those will fill up fast so if there are only a couple, you may find yourself waiting around to be able to use one. Speaking of it getting busy, that’s another important factor to consider. Visit the gym during the time of day that you most often plan to go to get a good idea of how busy the gym actually gets. If you visit at 2 in the afternoon but plan to go during the peak hours of 5-8, you might find that you are seeing a very different gym when you actually go to use it. While some people may thrive in a busy gym atmosphere, most people prefer a less busy gym so that they ensure they get the equipment they need to. You may also want to inquire about the Personal Training options that are available. How much are sessions and what packages do they offer? What are the qualifications of their trainers? If you anticipate using a Personal Trainer, this is all information you will want to make sure you get upfront. 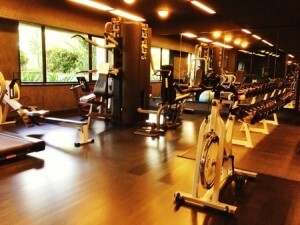 Some gyms may have additional facilities or services such as group fitness classes or a swimming pool. If you plan on using these, check to see if they are include in your membership price. Likewise, childcare is another big benefit if you have kids and want to be hitting the gym. For many parents with young kids, not being able to get a babysitter is one of the big reasons they don’t do their workouts as scheduled. If childcare is offered, this relieves you of this problem. Again, find out any costs associated with this so that you are prepared. Finally, you’ll also want to ensure that the location of the gym is right for you. It doesn’t matter how great the gym is, if it’s too far out of your way, you’ll find it a struggle to attend. Many larger gyms such as Fitness First have locations all around, so you should be able to find one that is relatively close to your home or place of work. This makes commuting very easy. If you take all of these factors into account when shopping for a gym location, you should be able to find the perfect place to call your fitness home. Ready to improve your fitness? Here are the steps that you should take moving forward. 1. Set your own fitness goals based on what’s most important to you. 2. Start seeking out a fitness club or gym that you feel comfortable in (or invest in some home gym equipment). 3. Familiarise yourself with the gym equipment, learning how to use each piece properly with good form. 4. Consider hiring a Personal Trainer to help you get started on a fitness program, or search online for a fitness program that’s right for you. 5. Begin your fitness program, making sure to constantly monitor progress as you move along and adjust your program as needed to see ongoing results. 6. Assess for all the components of fitness a few times a year to pinpoint any potential weaknesses you may have that you need to devote more attention to. Taking steps to lead a fit lifestyle is one of the best investments you can make in yourself and your health. Remember that fitness is not a one-size-fits-all approach. With so many different components to fitness – aerobic fitness, anaerobic fitness, muscle strength and power fitness, flexibility fitness, balance and agility fitness, coordination fitness, and mental fitness, there is never going to be a shortage of exercises you can do to further improve your level. Likewise, remember that you don’t have to ever use one particular piece of fitness equipment. If you hate running for instance, don’t force yourself to do the treadmill. Try the bike or the elliptical. If you hate weights, try resistance bands instead. Focus on enjoyment and you can be sure that you are giving maximum effort to each and every session you do. Start thinking of this as an ongoing journey that will last a lifetime, rather than simply a temporary phase of your life that you will do until you reach a certain level of fitness. If you want to get fit and stay fit, you need to make some lifestyle changes that will stand the test of time.